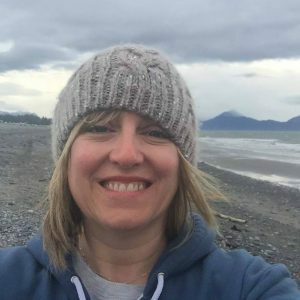 Tracy Lohman does development work for Trustees, and has lived in Alaska for nearly 30 years. Here she talks about falling in love with Alaska every day. Tracy with Portage glacier behind her, back when you could see it from the parking lot. 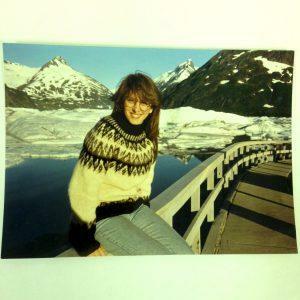 I arrived in Alaska summer solstice 1990. A local told me that the drive to Seward was stunning and not to be missed, so I rented a car and headed south on a brilliantly sunny day. Never, ever had I seen so many mountains! Following my curiosity, I turned off the highway and explored around Portage and Byron glaciers. Who knew that glaciers were so accessible and every shade of blue? In four short months, I became an Alaskan resident. Back then, you could see Portage Glacier and its ice on Portage Lake from the parking lot. Now you have to get on a boat to see the glacier, and the lake is ice-free. Photo compilation by USGS. Photo credits: 1914, Strough; 1939, Barnes 1943, Plate 17B; 1972, USGS photograph; 1984, Aeromap U.S.; 1999 and 2006, USGS photographs. 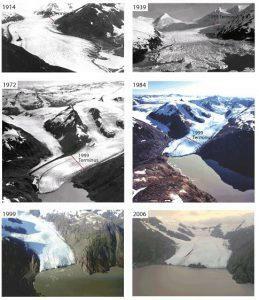 Portage Glacier has receded by over 5 km over the last century. Glaciers need centuries to form, and increase and decrease in size over geologic time, but now they are melting within a human lifetime. Melting glaciers are one sign of human-induced climate change, and a warning of severe consequences to come. Rising sea levels lead to coastal erosion, the flooding of waterways, extreme storms, and the loss of fresh water supplies and soil suitable for crops. Reports show Alaska and the Arctic are heating up at twice the rate of the rest of the country. The impacts are real. Dozens of Alaska communities must relocate, yet have no resources for such huge moves, even as some of our public servants deny the changing climate and refuse to address it. How could the loss of cultural sites, homes, public buildings and entire Alaska communities not make it onto his list of priorities? To ignore the changing climate is to ignore the harm done to Alaskans, and the severe public health and socioeconomic impacts to come. I refuse to deny what’s happening around us. I’ve lived in this state for almost 30 years, and I want to believe that Alaskans take care of each other—and that means working toward a just transition to alternative energy sources, reducing fossil fuel consumption, and finding ways to support those already suffering the impacts of a changing climate. I work for Trustees for Alaska because I want to contribute to taking care of this state’s future. I want to work toward action on climate change, and to protecting our fish and wildlife, our clean air and water, and our cultures and communities. I’m not a lawyer, but I know that supporting the legal team at Trustees helps protect the Alaska I fell in love with that first solstice day when the sun shone well past my bedtime. Every day I fall in love with this place again.